January 30, 2012 - The Department of Transportation (DOT) has fined Spirit Airlines $100,000 for failing to appropriately record and respond to complaints about the carrier’s treatment of passengers with disabilities, violating DOT’s rules implementing the Air Carrier Access Act which prohibits discrimination in air travel on the basis of disability. Under DOT’s rules, carriers must sort disability-related complaints into categories based on the type of disability and nature of the complaint, and submit an annual report to the Department on disability complaints received the previous year. Each issue raised in a complaint must be recorded separately to account for the total number of complaints a carrier receives. The Department compiles carrier reports, publishes them on the Internet for consumers to compare, and submits them as required by Congress. In addition, if an airline receives a written complaint alleging a violation of the Department’s disability rules, the carrier must provide a written response within 30 days that specifically discusses the complaint, gives the carrier’s view of whether a violation occurred, and states that the complaint may be referred to DOT for an investigation. In May 2010, the Department’s Aviation Enforcement Office conducted an inspection at Spirit’s corporate headquarters in Miramar, Fla., during which it reviewed disability-related complaints received by Spirit in calendar year 2009. The Enforcement Office later reviewed disability complaints received by the carrier in calendar year 2010. 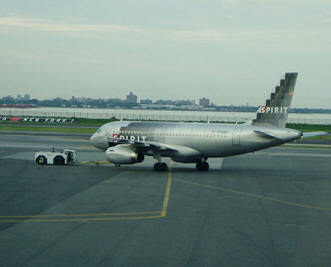 The review showed that Spirit violated the Department’s rules by failing to adequately categorize and account for all the disability-related issues that were raised in complaints received during 2009, leading to an undercounting of the actual number of complaints in the carrier’s annual report to DOT. Many issues raised in the complaints were not separately counted, and a large number of additional complaints were not accounted for, the Enforcement Office found. In addition, Spirit failed to provide adequate responses to a vast majority of the disability-related complaints it received in 2009 and 2010. Spirit Airlines, Inc. is a ultra low-cost carrier operating scheduled flights throughout the Americas. The airline is headquartered in Miramar, Florida, in the Miami metropolitan area. Spirit currently maintains a base in Fort Lauderdale, Florida and Detroit, Michigan. Over half of the airline's flights are to destinations in the Bahamas, Caribbean, and Latin America.